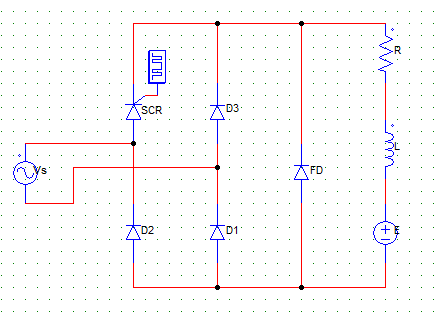 This set of Power Electronics Problems focuses on “Single-Phase Semi-Converters-3”. Explanation: From 0 to α there is no conduction. SCRs are gated at α and than naturally commutated at π. Hence, conduction angle = π-α. i) They do not provide smooth variation of output voltage. ii) They inject harmonics into the power system. iii) They draw non-unity power factor current for finite firing angles. Explanation: All the above given statements are correct. They all are the major drawbacks of using phase controlled converters. Explanation: The period during which both the incoming and outgoing SCRs are conducting is called as an overlap angle. 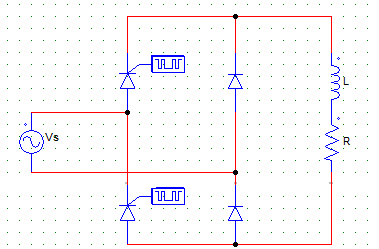 This happens when inductance comes into picture either on the load or the source side. Explanation: GTOs unlike conventional SCRs can be turned off by providing a negative gate pulse. Hence, using GTOs the turn off as well as the turn-on time can be controlled. 5. Find the average output dc voltage of a single-phase semi-converter with Vs=230 V and firing angle of 30°. The converter is operating under continuous conduction. Explanation: Vo = √2Vs (1+cosα)/π. 6. In the below given circuit, the average value of output voltage is 191 V. Find the value of the average current through the given load if E = 100 V and R = 5 Ω. Assume that the load current is continuous. Io = Vo-E/R = 191-100/5 = 18.2 A. 7. In the below given circuit, the average value of output voltage is 191 V. Find the value of the power delivered to the voltage source E. Take E = 100 V and R = 5 Ω. Assume that the load current is continuous. Explanation: Note that as the load current is continuous, L can be neglected. P = E x Io = 100 x 18.2 = 1.82 kW. 8. A single-phase semi-converter is operated from a 240 V, 60 Hz, AC source. It is fired at an angle of 45°. Find the value of average output voltage. Explanation: For a semi-converter, the output voltage Vo = √2Vs (1+cosα)/π. 9. A single-phase semi-converter is operated from a 230 V, 60 Hz, AC source. A DMM connected at its output terminals read 219.3 V. Find the value of FF (form factor). FF = Vrms/Vo = 1.241. 10. Name the circuit shown below. Explanation: It is using only two SCRs, hence it is a half controlled semi-converter. It is an asymmetrical configuration as each leg has same devices. 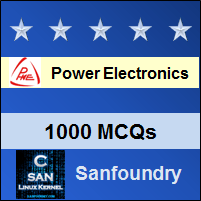 To practice problems on all areas of Power Electronics, here is complete set of 1000+ Multiple Choice Questions and Answers.